So many people make resolutions for the new year--healthy eating, exercising, getting organized, save money--but quickly cast them aside. At least with Tupperware you have the opportunity to keep those resolutions. Modular Mates will organize your kitchen cupboards--everything is kept fresh in a container that stacks and maximizes your cupboard/cabinet space. And knowing what food you have means you'll spend less on things that you think you need but already have. FridgeSmart Containers keep your fridge organized, too. And they keep your fruits and vegetables fresher longer. That saves you even more money! Plus by eating more produce, you'll keep that healthy eating resolution. 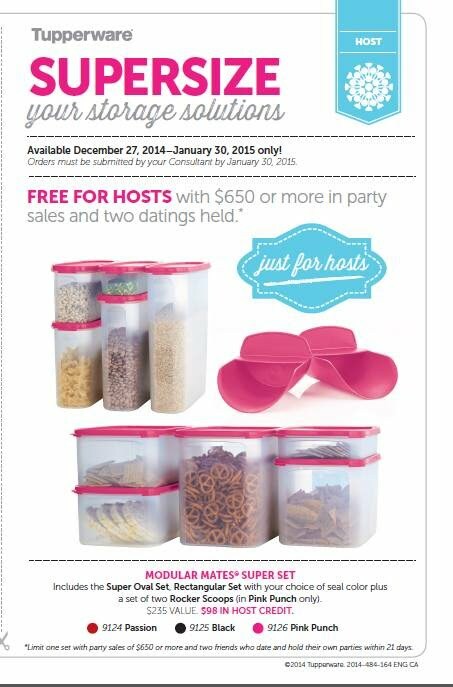 January is a great time to host a Tupperware party--Modular Mates are on sale and qualified hosts can get the Super Set for free! Or, open an account with Tupperware and get your Modular Mates and FridgeSmart containers at wholesale! You'll make money at parties which you can use to purchase the Tupperware you need--so really, you're getting your Tupperware for free! Send me a message and I'll help you get started, whether it's to make a purchase, host a party, or open your account. I'm here to help!